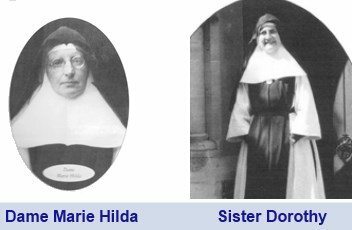 In 1897, a group of Bernardine Cistercian Sisters arrived in Slough from France, to escape from religious persecution. They had found a house in Langley they thought might be suitable for a school. It was called Aldin House and had been built by Baroness Coutts, one of Queen Victoria’s ladies in waiting, in the 1860s. She never lived in it and sold it to the Reverend J Hawtrey who used the building as a Prep school for Eton College. He added the chapel and when he sold it in 1884, it was taken over by a Jesuit Community who lived there until 1890, from when it lay empty until the sisters arrived in July1897. In October that year, having worked hard to make the derelict house habitable, they brought over 12 French girls, all over the age of 15 and with two English girls in addition, they founded the school, led by Dame Lucie Destailleurs. They celebrated Guardian Angels Day that very first year, a tradition which has been handed down until the present day. In 1901, a lay teacher was professed, taking the name Dame Marie Hilda, and she then became the first Headmistress of the school. 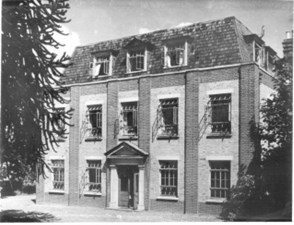 It was still a finishing school as well as a boarding school, teaching subjects such as Music, Needlework, English and Deportment. 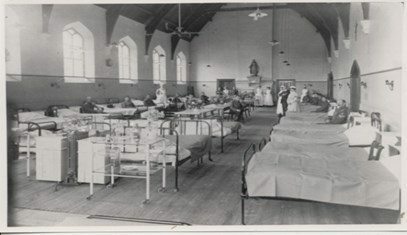 During the First World War, the Old Hall, as it is now called, was turned into a Hospital for wounded soldiers and was graced by a visit from King George V and Queen Mary. Some of the girls were allowed to visit the soldiers and also helped the war effort by knitting mufflers for sailors. By the 1920s, younger students had been admitted and the school was recognised by the Board of Education. Pupils from that era still alive today remember Guardian Angels being celebrated each year and they also remember how strict the Sisters were. Another school was founded across the road, catering for day pupils of all ages. It was named St Joseph’s. The Convent school continued to offer boarding education to girls from 11-18. In the 1930s, a new building was added to accommodate the growing numbers of pupils. It now houses the History department and the locker rooms. During the Second World War, the building was again used, this time as an Air Raid Wardens’ Post. The school continued, taking in evacuees from London, although some of its own pupils were sent away to Cornwall or even America. Dame Marie Hilda showed her devotion to her pupils by sitting with them in the bottom corridor, used as an air raid shelter, sometimes all night. She finally retired as Headmistress in 1945 and Sister Mary Dorothy took over. In the meantime the 1944 Education Act made a number of changes for education in this country, following which the two schools, St. Bernard’s and St. Joseph’s, amalgamated. 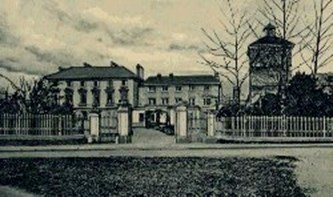 St. Bernard’s now consisted of an independent senior school with grammar places and some boarders, while the children of preparatory school age were to be taught in the building vacated by St. Joseph’s. 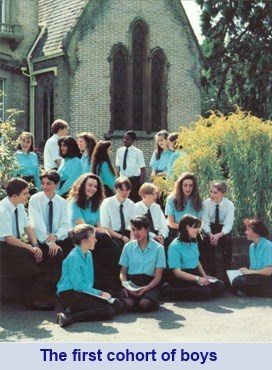 During the 1960s, a further important change happened when in 1966, the school became Voluntary Aided, which meant it became under the care of the local Education Authority and was no longer independent. All pupils had to pass their 11+ examination to enter the school. The boarding house closed around the same time. More buildings were added, giving the school a new larger Hall as well as a Maths and Science block. 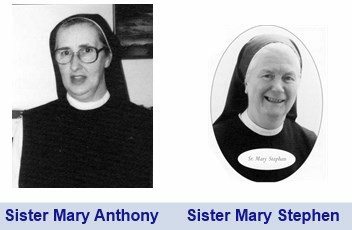 In 1970, Sister Dorothy retired and Sister Mary Anthony took over as Headmistress. The school started to enjoy success in a number of fields such as netball and singing. Its prestigious choir won the International competition: ‘Let the People sing’ and released a record. In 1982, Sister Mary Anthony left the school to spend some time in the school the Bernardine Sisters had founded in Goma, Africa. Sister Mary Stephen became the new Headteacher and presided over the biggest change of all: the admission of boys in 1989. This change meant a need for more new buildings: the New Hall was extended and a Technology block built for this newly compulsory subject, shortly followed by another new block (the 90s block) to house the English and Geography departments. This was also necessitated by the reversal back to 11+ entry, whereas for several years the school had admitted pupils at 12+. 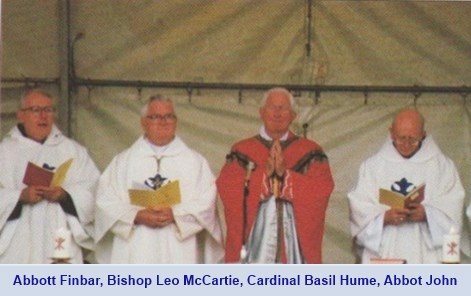 In 1997, the school celebrated its centenary in a number of different ways, the main one being a wonderful Mass celebrated by the late Cardinal Hume. A tree was planted and many events took place during the year, including productions, concerts, open days and photographs of all classes, now displayed on the corridor leading to the New Hall. In 1998, Sister Mary Stephen retired and Mr John McAteer, who had been the Deputy for a number of years, took over as the first male Headteacher of a school that was now fully co-educational. In 2005, the new Sports Hall was added and then in 2006, the Sisters withdrew from the school and founded a new Monastery in Brownshill, Gloucestershire. Several of the Sisters went up North to the monastery at Hyning in Lancashire and the rest went to Brownshill. Many events took place to mark their departure and a history of the school was performed on stage and in film. The school was renamed St Bernard’s Catholic Grammar School. The Sisters’ legacy still carries on in many ways, such as the Mission Statement. The school still has close links with them and with the Bernardine monasteries all over the world. Following their departure, the school continued to develop and flourish, under the leadership of Mr McAteer, and to enjoy success in many areas, such as Sport, Drama, Music and Public Speaking, quite apart from its consistently excellent academic results. In 2011, the OFSTED inspection judged St. Bernard’s to be an outstanding school. This was followed by a Diocesan Inspection which also judged it to be outstanding. 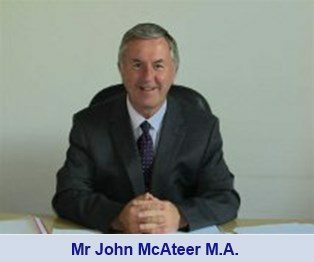 After 14 years of distinguished service as Headteacher, Mr McAteer retired in July 2013.